Strider, known as Strider Hiryuu (ストライダー飛竜) in Japan, is an action game developed by Capcom and released for CPS arcade hardware in 1989. It was subsequently brought to home consoles and computers, including the Sega Mega Drive and Sega Master System. It is the 21st Century. Earth was ravaged by series of ecological disasters that claimed the lives of millions. Out of the catastrophe, one man took control of what remains of the human race: Grandmaster Meio, a seemingly immortal and omnipotent man who is worshipped as a living god by his followers. With science, military and even the nature itself is on his side, Meio declared himself Emperor and formed the center of his empire in the Kazafu City, a massive city located in the Eastern Europe. He is ruling the world with an iron fist. Only force that can stop this man is Striders. A group of highly talented operatives who are skilled in infiltration, sabotage and assassination. Stiders initiated a massive assault on the Meio's forces, but despite their skills, all of them were cut to the last man. Enter Strider Hiryu, youngest man to ever complete the hellish Strider training program with an A rank and only Strider left alive. Armed with his lethal plasma sword, climbing equipment, and a small amount of robotic weapons, Hiryu must face unsurmountable odds and save the humanity from the clutches of an evil god. Strider is an action-platformer. The highly mobile protagonist needs to can walk, run, slide and climb to conquer all five stages and defeat the self proclaimed world ruler, grandmaster. Aside from his sword, Strider can also employ robotic helpers (one of them resembling a tiger) to fight his adversaries. Emperor's official seat of power, Kazafu City is the a massive sprawling metropolis. Even though they are better off compare to the poor souls living in other destroyed cities around the world, citizens live under mortal fear of Meio's fanatically loyal army and soulless robotic weapons that patrol the city. Engage armed soldiers who still stick to their cold-war era uniforms. Eliminate Strobaya, a muscle bound giant and face off the assembly members who will combine and create Ouroboros, a caterpillar like robotic weapon who can climb walls and attack with sickle like mandibles. Endure freezing cold as you fight back hungry wolves and other armed enemies. Destroy Mecha-Pon, a prototype robotic gorilla and climb through the salt mine shafts. Solo, a relentless, jet-pack equipped bounty hunter will be after your head. Retire him from his mercenary career if you don't want him to be a problem for you in the future. Reach the air field and jump from aircraft to aircraft to reach Meio's battleship. Be on the lookout for Pooh sisters, peerless martial artists who will attempt to kill you in the name of their emperor. A symbol of Meio's limitless power, Balrog is a flying battleship capable of razing cities to rubble. Evade cannons and other gun emplacements as you try to find a way inside the ship's hull. Destroy the prototype graviton generator and relieve the Captain from his post to bring this flying monster to the ground. Humid jungles of the South America will be a stark contrast to the freezing cold of the Siberia. Fight back the female warriors of the Amazon tribe somehow managed to survive the outside world and its demise. Survive the onslaught of once believed extinct dinosaurs. A gigantic T-Rex will be waiting for you at the end of this level. Prepare for the final showdown with a god. Every enemy you have faced before will be ready to lay down their lives for their emperor. At the end of the level, you will find out whether or not Meio deserves his title. Multiple other versions of Strider exist, all of which (bar the aforementioned X68000 version) are widely considered to be less accurate than the Mega Drive version. Ports were made to the Amiga, Amstrad CPC, Atari ST, Commodore 64, DOS and ZX Spectrum. A PC Engine Arcade CD-ROM², version, exclusive to Japan and released in September 1994 could be considered the Mega Drive's closest rival, but still falls short due to a number of graphical omissions (in exchange for an extra level). Strider was unofficially followed by U.S. Gold's Strider II, however Capcom later returned in 1999 to make a true sequel under the name of Strider 2. The character of Strider Hiryuu has also appeared in other Capcom games, such as 1999's Marvel vs. Capcom: Clash of Super Heroes, released among other systems for the Sega Dreamcast. The Mega Drive version was also made available for the Wii's Virtual Console service in 2011. 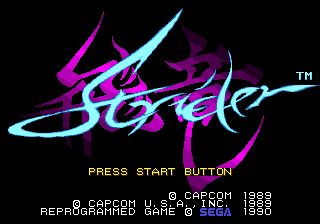 The Sega versions of Strider were licensed from Capcom, but the Mega Drive version was developed internally at Sega and the Master System version was outsourced to Tiertex under Sega's production and supervision. Allegedly Sega was not given much support by Capcom, forcing the teams to rip graphics and reverse engineer arcade units to create both games (it is rumoured that practise was also in effect for Ghouls'n Ghosts and Final Fight CD, Capcom not partaking in Sega development on their own until Street Fighter II: Special Champion Edition). Strider was brought to the Sega Mega Drive relatively early in the system's lifespan, debuting in late 1990. It was seen as one of the hard hitting 16-bit action games designed to encourage users to migrate from Nintendo's NES to Sega's console, boasting high definition graphics and recorded speech samples. It was the first 1MB (8Mb) ROM cartridge released for the system, making it one of the largest cartridge-based video games available at the time. The comparison between Mega Drive and NES is striking when discussing Strider, as despite Capcom having a hand in both developing and publishing the Nintendo version, the console's technical restrictions led to an entirely different game. Meanwhile the Mega Drive version was for a while the most accurate home arcade conversion available to consumers (inevitably superseded by a Sharp X68000 version in November 1992). The most noticeable differences in the Mega Drive version are the slower attack speed (especially when hanging from the ceiling) and lower acceleration (meaning the jungle stage and final stage's inverse gravity section require different approaches to that of the arcade). Like its arcade counterpart, the western versions lacks Hiryu's "Ha!" shout while attacking with the sword. There are also slight differences between regions; when playing up to the boss rush section of the final stage without losing a life in the Japanese Sega Mega Drive version, there is a high chance that Ouroboros (stage one boss), normally transporting the player to the place of the final battle, will not appear. The player has to deliberately lose a life to respawn Ouroboros. This issue was apparently fixed in the Western versions. Continues may be used in the Western versions whereas the Japanese release requires the player to input a cheat code to enable them, and the famous line, "All sons of old gods, die! ", spoken by the final boss, was removed from the Western versions. Strider is one of the few Sega Mega Drive games that has noticeable load times during stages. The game stops for about half a second when new background graphics or big enemies, like boss characters, appear. It also features an original ending scene. This port is made by Tiertex, who also responsible for the less-than-impressive Strider Returns. Unlike its NES counterpart, the Master System Strider is a compacted version of the arcade game, with simpler graphics and sound as is to be expected of the console. It is known, however, to suffer from heavy slowdown when the engine is under stress, so much so that simply attacking will cause the frame rate to drop. Most of the backgrounds are replaced with simple black and cutscenes appear with no rhyme or reason with "No one defeats the master" is repeated over and over again. The ending is also non-sensical as it implies that the entire game was a simulation for the real mission. This "simulation" story is also confirmed in the Master System manual of the Strider Returns. Because of these shortcomings, Master System version is usually considered the worst port of the original game. NEC Retro has more information related to Strider Hiryuu.